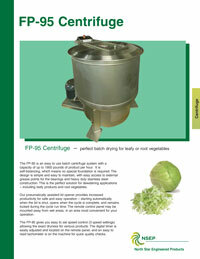 The FP-95 is an easy to use batch centrifuge system with a capacity of up to 1950 pounds of product per hour. It is self-balancing, which means no special foundation is required. The design is simple and easy to maintain, with easy access to external grease points for the bearings and heavy duty stainless steel construction. This is the perfect solution for dewatering applications – including leafy products and root vegetables. Our pneumatically assisted lid opener provides increased productivity for safe and easy operation – starting automatically when the lid is shut, opens when the cycle is complete, and remains locked during the cycle run time. The remote control panel may be mounted away from wet areas, in an area most convenient for your operation. The FP-95 gives you easy to set speed control (3 speed settings) allowing the exact dryness for various products. The digital timer is easily adjusted and located on the remote panel, and an easy to read tachometer is on the machine for quick quality checks. 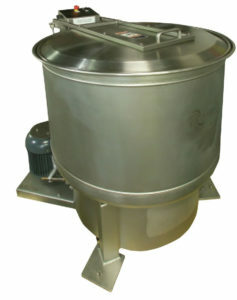 Capacity / Hour 1950 lbs.